"What's the matter? That's my way." As the years go by, the number of true "event" DVD releases continues to dwindle. Criterion always seems to come up with the goods though, and this latest box set provides just another reason as to why they're followed avidly by so many. Rainer Werner Fassbinder's mammoth miniseries Berlin Alexanderplatz has been unavailable (legally, at least) for years, but a recent restoration done in Germany gets the series back into the spotlight, allowing those of us who only knew it by reputation to see what the fuss was about. The series, based on Alfred D\u00f6blin's 1929 novel, tells the story of Franz Biberkopf (G\u00fcnter Lamprecht), newly released from prison. Convicted of manslaughter in the death of his girlfriend, Franz has spent four years in prison and exits unsure as to his place in the world. By the end of the first episode, he has decided to become an "honest" man, even if this means becoming a street peddler. In a series where the first episode is titled "The Punishment Begins," you'll hardly be surprised when Franz runs into...difficulties. Beyond this, it's difficult to try and summarize more of the story, as it simply spans too much material. Those who haven't seen the series may wonder, given most people's general lack of time and the large time investment this series requires, whether this is worth it, given the bleakness of the plot and the general unlikeability of most of the characters. Let me encourage any doubters to give this a chance, as initial misgivings will hopefully turn into an enthralling experience, as the fifteen-plus hours of the series allow for deep explorations of character and a broad tale to be told. Lamprecht is immense as Franz, giving life to an often unlikeable character, a character acted against rather than acting on his own behalf, a character around whom things happen, rather than making them happen. He's often unlikeable, a dull, thick-witted clod, a victim waiting to be slaughtered. standing in for Germany as a whole. Gottfried John plays Reinhold, a supremely disgusting individual whose sublimated homosexuality thrashes about within the character, and expresses itself in his hateful treatment of a parade of women, many of whom get shunted off to Franz, including the gentle Mieze (the excellent Barbara Sukowa), who, like Franz, is not canny enough to survive in a vicious world. The boldest touch in the series is the epilogue, a two hour journey through Franz's tortured mind, in which we see most of the characters of the story re-visit Franz in a series of surreal, occasionally bizarre interludes. It doesn't always work, but it's never less than fascinating. Throwing in modern music (including Janis Joplin and Lou Reed) not to mention angels and other fantastic elements, it's a tremendous shock to the system, given the previous 13 or so hours we've just gone through. But as a final vision of the destruction of Franz, it packs quite a wallop, regardless of how silly some of it seems today. It's bold and more gutsy than most stuff you'll see on TV, even today. Do yourself a favor and give this a look, even as a rental; it's fearless, occasionally frustrating, and sometimes aggravating, but it's nothing less than original. Image Transfer Review: Shot on 16mm for German TV, Berlin Alexanderplatz will never look spectacular, suffering, even after this restoration, from graininess, softness, and weak blacks and shadows. That said, it's hardly terrible-looking, it's simply a product of the technology of the time. Criterion's transfer looked good enough to my eyes, but those who are sticklers for such things will want to know that Criterion was forced to slow down the speed of the show for NTSC displays, shot as it was for PAL video displays. Not having seen it previously, I can't say how much of a difference this makes, but it didn't noticeably impair my viewing experience. The white, optional subtitles are of Criterion's usual excellent standard. Audio Transfer Review: Like the video, the audio has been scrubbed up, but the original mono isn't going to ever wow anyone. It's serviceable and does the job. No complaints. Extras Review: An excellent arrangement of bonus materials, as per usual. Notes on the Making of 'Berlin Alexanderplatz' (00h:44m:10s) is a contemporary documentary looking at the filming of the series, with plenty of behind the scenes footage to check out. Berlin Alexanderplatz Remastered (00h:32m:00s) delves into the technical aspects of the restoration, sure to be of interest to those who approve and disapprove of what was done to the footage. A Mega Movie and Its Story (01h:05m:11s) is an excellent new documentary looking back at the series, and featuring interviews with the major players including Lamprecht and John, as well as crew members. It's quite good, giving us a nice overview of the film and its production and reception. Fassbinder biographer Peter Jelavich discusses the director in a lengthy interview segment (00h:23m:55s), and finally, we get the 1931 film adaptation of the novel, on which Doblin himself worked. At a mere 83 minutes, it certainly doesn't approach the Fassbinder for depth and breadth, but it has its own charms nonetheless. Criterion also includes the usual booklet, including several essays about the film and chapter and technical listings. 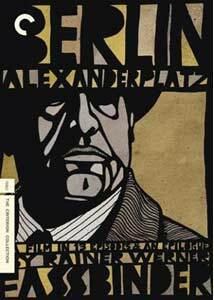 Criterion puts together another superb package in their release of Fassbinder's epic Berlin Alexanderplatz, giving us the restored version of the series and several absorbing extras, including documentaries and the first adaptation of the film and 1931. It's never an easy-going viewing experience, but one to be savored all the same.